The Diaclone prototype of Devastator comprised of only five parts and combined in the same way as most five team combiners do with one big robot serving as the base and being combined with four smaller robots serving as the limbs. While the Diaclone Devastator kept the yellow, red and blue color scheme, the final product was six equally sized small robots combining into one giant robot. The Diaclone version of the Constructicons were very similar to the neon green and purple versions that were released in the Transformers line albeit with a red, blue and yellow color scheme. 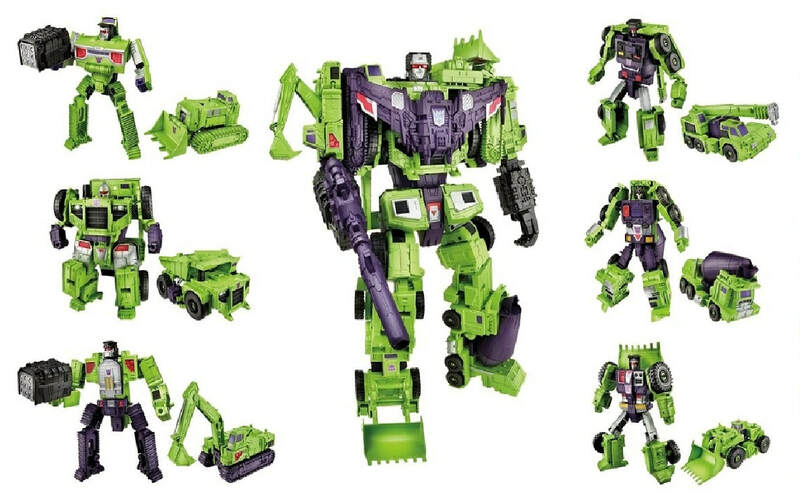 While this color scheme may have been more colorful than the neon green and purple color scheme of the Transformers version of Devastator, it does not reflect the same unified look that the Transformers version has. The color scheme of the Diaclone version however is a better disguise for the Constructicons as the colors of the vehicles are closer to their real life counterparts than a neon green and purple color scheme would be. The Transformers version of the Constructicons have a uniformed color scheme which makes for a beautiful unified look when they merge into Devastator. The neon green and purple color scheme has been iconic and Devastator is considered as one of the most popular Decepticons ever. Though this makes for a nice look as a team and when combined as Devastator, the color scheme does not make sense if the intent was to be "robots in disguise" as the color scheme is obviously off to pass on as normal construction vehicles.